Great knife. My only two complaints are: the scales, although not painful to my hands it has done damage to my pockets. Next where the blade comes in contact with the locking bar. The m4 steel has worn a small groove in the locking bar. Doesn't affect the ability to lock. Overall my favorite edc. 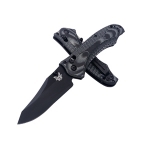 I would recomend this knife to anyone. Hi, I have to say that I'm from Italy, so you could understand the price and my "strange" english. 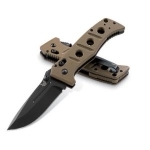 I like this knife, it is a great quality tank knife. This knife is fantastic. I have used it on everything from cardboard to wood to aluminum cans. It has remained sharp and excellent. The blade material is perfect. And everything is well worth the price. It is by far the best knife I have ever handled. If you dont yet have one get one! And lots of people say they dont like the rigidness of the scales but I actually like it a lot. It is not at all uncomfortable to me. I did NOT have to sand it down at all. It came perfect and it stayed perfect! Sounds to me like both of you have a hard on for trolling. It doesn't matter what he bought the knife for as long as he likes it. Same with me I love my contego and the ergos work for me perfectly, don't down play a knife just because you do not like it. I can tell that both of you have a problem hearing things you don't like or that are against your opinion. The post above shows nothing more than the fact that " the collector" has teeny tiny hands and has never actually done anything in the field with the tool. It's a very useful tool, unlike the reviewer above. then you didn't use it much if you say the ergos are good. this is by far the worst ergos i have ever seen on a knife period. i have owned more than 400 different styles of knives both cheap and expensive and i stand by what i said. take it out of your pocket and actually use it rather than hype up something that you clearly wasted $180 on so you can feel better about your purchase. this is a great knife, especially for those who would like some experience with a less common but, excellent steel. i have used this knife for hard use in cutting cardboard and carving wood and found that the ergonomics were terrible, i had to grind down the sharp jimping as it cuts into your hand with heavy use and the handles, i rounded the edges off as well, i also had to grind the edge down as it was slapping against the stainless steel back spacer and after all that, i found it to be a great knife. 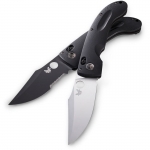 the axis lock is great and allows for easy opening and closing of the blade and seems to be a very rigid design. Got a great deal from knifecenter with free shipping. Nutnfancy does a good review. Great ergonomics and love the blade shape. Awesome steel and I really dig the addition of the carbide glass breaker. I did find it helpful to sand down the outer edges of the scales and to cover the scale with a small patch of JB Weld at contact point of the pocket clip to reduce friction on clothing. Dispite having to apply these mods to a $140 dollar knife, I am still very pleased with my purchase. Currently my favorite folder of all time. The Adamas would be a close second. Great knife. 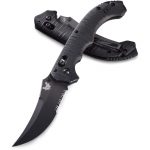 Ergonomics are good...although a little rough (you will certainly never drop this knife). Lock-up is strong. Blade steel is fantastic. 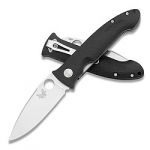 Overall, this knife is a great value and a hard-use folder.